At the core of the Buddhist philosophy is the concept of ‘emptiness’, the understanding that nothing exists in and of itself. The famous Indian philosopher Nagarjuna (ca. 200 CE) investigated the happiness and suffering in his time, and came to this liberating insight. But how can this view help us now to be happier in everyday life, and to live with less fear? This weekend, Thubten Chödron will help us explore what makes us experience something as pleasant or unpleasant, how feelings of happiness and fear arise and turn into their opposites, and whether what we call ‘happiness’ is lasting. Her clear and accessible way of teaching will help us discover – through explanation, as well as through meditation – how an insight into the deeper nature of existence can open our minds. 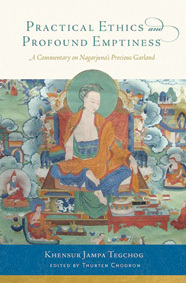 The teachings will be based on the book Practical Ethics and Profound Emptiness , which Thubten Chödron wrote based on Khensur Jampa Tegchog’s teachings on Nagarjuna’s text Garland of Advice to a King .